Combined with the S2000, the radiometer allows to obtain a complete station of hardening with an unequalled control. 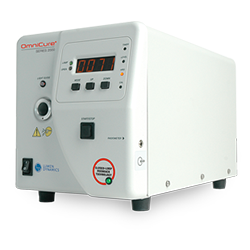 The radiometer R2000 is the best way to determine the power arriving on your glues and the ageing of guides light. 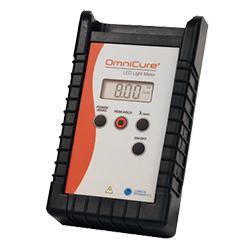 It is essential to calibrate correctly equipments OmniCure ® after the change of their lamp and allows to measure the radiation out of guides lights. Coupled with an adapter LOA, it also allows to measure the energy directly out from the fiber or from external support of filters, what allows to control exactly the ageing of guides light. 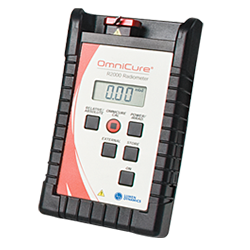 Conceived for the systems of punctual polymerization in UV radiation, OmniCure ®, the radiometer R2000, offers outstanding possibilities for the calibration and the power adjustment of your equipment Serial OmniCure ®2000 thanks to their automatic communication. Detect automatically all the diameters of guide of standard light of the industry. Easy commands and detailed display facilitating the use and the maintenance of the device. The radiometer R2000 includes an exclusive system of detection which measures exactly the bandwidth between 250 and 600 nm. The radiometer R2000 offers an automatic tuning of the reach to keep a precision of 5mW / cm2 in 60 W / cm2. The electronic configurations of the radiometer R2000 allow a particular connection of sensors for a direct measure of the bright energy towards the polymerization. The site radiometry of polymerization is the most advanced and the most precise technique of control which measures the quantity of radiation arriving on the adhesive. The exclusive optical interface of the radiometer R2000 collects the light on a vast surface and a digital opening, eliminating practically the dependence on the profile of the beam of light. 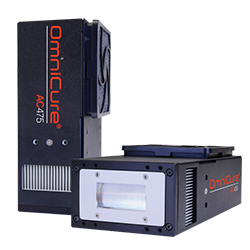 The radiometer R2000, conceived in association with the platform of the systems of punctual polymerization in UV radiation OmniCure ®, is endowed with uniques characteristics when it is used with OmniCure ® S2000. The communication puts into series between the radiometer R2000 and the system of punctual polymerization OmniCure ® S2000 allows the user to calibrate the system and to define the levels of energy illumination by means of the advanced commands of interface of the radiometer R2000. Serial communication with serial OmniCure 2000 to define the levels of energy illumination and to calibrate the system from a single reference point. Exclusive system of detection for the precise measure of wide bandwidths (250 – 600 nm) suiting in numerous different light sources. Special optical interface which eliminates practically the dependence of the profile of beam and which improves considerably the precision of the measures. Memory allowing the storage of data and communicating with a software for the transfer of the information in a computer. Ready to be used with sensors adapted as the ring radiometer for polymerization and the site radiometer of polymerization. The second model of the family OmniCure ®, S1500 is equipped with a lamp of 200W with a life expectancy protected from 2000 hours. 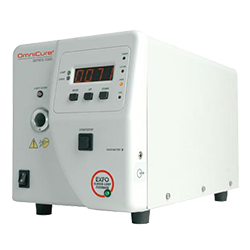 Ideal for the manual or automated applications, this system is very complete. 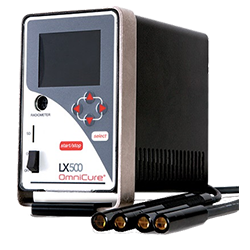 The last model of the platform of polymerization OmniCure® possesses remarkable commands and lamp of 200 W.
The OmniCure® LX500 system is designed with proprietary Intelli-Lamp LED technology that monitors LED head temperature, lifetime data, and automatically maintains optical stability +/- 5% during an exposure. The Light radiometer LED to meter is the best way to determine the power arriving on your glues and the ageing of guides light.